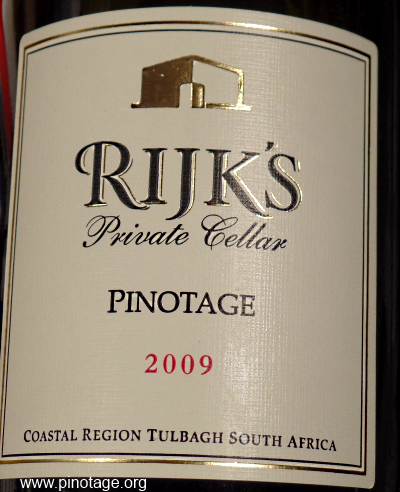 My Wine of the Month for January 2016 is Rijk’s Private Cellar Pinotage 2009. It was one of the wines in my wine tasting club’s annual blind tasting competition, and this particular bottle is the ‘runners-up’ prize we enjoyed with dinner the evening afterwards. Rijk’s do make excellent Pinotage. I recall when they started planting some pundits said Tulbagh was too hot to make fine wine. They were wrong and Rijk’s have proved it. This maybetheir basic Pinotage (their 2011 Reserve has 5 Platter stars and is a 2015 Top 10 Winner) but it’s darn good. 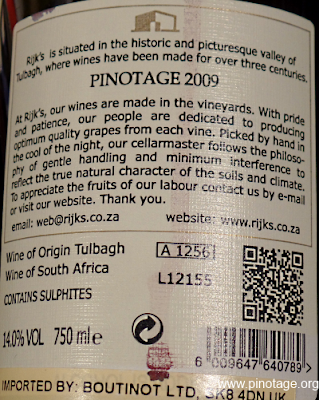 Rijk’s tend to release their wines with a little bottle age, and this 2009 is currently available in the UK. I loved its seamless combination of fruit and tannins. It’s a real food wine, straight down the core with no wild edges. Suave and sophisticated.